Volunteers are our greatest resource without whom guiding and all its opportunities just would not exist. As the saying goes, volunteers don’t get paid, not because they’re worthless, but because they’re priceless. 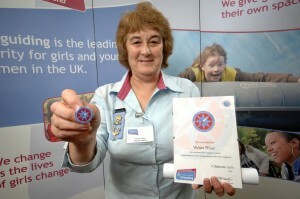 The volunteers in Girlguiding Wiltshire North are no exception to that. If you decide to complete the adult Leadership Qualification and become a Leader you will be allocated a mentor. She will guide you through the process of completing the qualification. It’s competence-based so you will complete most elements by taking an active part in running a unit and getting involved with local guiding. There are three mandatory training sessions you will need to attend, listed below. Leaders in training or those changing or adding a section should attend a section-specific training in the County. This is a training on the Rainbow, Brownie, Guide or Senior Section programme. They are organised by the Leadership Qualification Training Coordinator and can be covered by attendance at our County training day or a 1½-2 hour evening training. 1st Response is a basic six-hour first aid course designed specifically for members of Guiding and Scouting. It is valid for three years and gives you the basic first aid skills you need to provide first aid within your guiding role. Leaders in training must complete the full course or hold an equivalent course recognised by Girlguiding. Details of accepted equivalent courses can be found on the Girlguiding website. To renew the qualification you will need to attend a refresher/renewal course after 3 years. Each unit must have a least one fully qualified, up to date, 1st Aider. Those who have an external first aid certificate may attend a 1st Response refresher when the time comes to renew. Courses for both the 6 hour and renewal trainings are run throughout the year at different locations. These are advertised on the website (members' area), in the County newsletter and through the monthly mailing. Girlguiding volunteers have a responsibility for the promotion and development of guiding and ensuring that it takes place in a safe environment. This applies not only to the girls and young women in our care but to other adults in guiding as well. To this end Girlguiding has a policy called ‘Safe Space’. As part of the Leadership Qualification Leaders in Training must attend a Safe Space training. In exceptional circumstances and in consultation with a Commissioner the online module can be used. Safe Space training consists of a 2½ hour session delivered by a Girlguiding Trainer and covers Girlguiding’s Safe Space Policy. This includes issues such as risk assessment; safety both at the meeting place and out and about; child safeguarding and other Issues affecting our membership. See the Girlguiding website for more information. NB: Qualified Leaders wishing to update their knowledge of the Safe Space Policy may also attend this Training. Courses are run at regular intervals at different venues. Training and development aren’t just for new volunteers. We offer a full range of training opportunities for all levels of experience, as listed below. Leaders in training or those changing or adding a section should attend a section-specific training in the County. These are organised by the Leadership Qualification Training Coordinator. This can be covered by attendance at our County training day or a 1½-2 hour evening training. Courses for both the 6 hour and renewal trainings are run throughout the year at different locations. These are advertised on the website, in the County newsletter and through the monthly mailing. Every year, usually in the autumn, a County training day is held at Royal Wootton Bassett Academy. This full day of training has a variety of sessions on offer for all levels of experience and volunteers may attend for all or part of the day. It is a marvellous opportunity to meet Leaders from other areas and sections, share experiences, be trained by Girlguiding and external Trainers, get new ideas for your programme and have fun! This is another opportunity to develop your guiding skills. The date, time and venue varies from year to year according to needs. Every two or three years a Girlguiding Wiltshire North residential weekend is held at Foxlease, Girlguiding’s Training and Activity Centre in the New Forest. The weekend gives Leaders a chance to do all or some of the following: attend training sessions, socialise, get out into the New Forest, take part in an outdoor activity, and meet with others in a fun-filled environment. For many girls, going away is the experience that they remember the most. If you have thought about taking your unit away, or you are looking for a new challenge then the Going Away With scheme is for you. We run a ‘Going Away With’ training at a weekend usually in the spring to give you information and help with starting and completing the Going Away With scheme. This is a flexible, modular qualification (like the Leadership Qualification) and allows Leaders to gain the appropriate qualification to take girls and young women away, depending on the type of residential you are planning. If you miss the scheduled training individual support is available, as well as having a mentor. This scheme is open to members who have completed the Leadership Qualification, and currently hold an active role as a Leader, Commissioner or Adviser. It is possible to request a training on other guiding related subjects. If there is anything you or your District/Division feel you need then please contact us. Girlguiding is always looking out for new, enthusiastic and creative Trainers. The process of becoming a Trainer is much like gaining your adult Leadership Qualification … except it’s all about training. A Trainer’s role is to plan and deliver training to volunteer Leaders. In this way they help make sure girls and young women get the best possible guiding programme experience. How do I go about becoming a Girlguiding Trainer? All trainers take the Girlguiding Trainer Qualification and learn on the job. The qualification is flexible and not paper-orientated. You will be assigned a Tutor and through regular meetings, your own personal development and running trainings of your own (with support as required) you will work your way through the Trainer Qualification – a series of modules that demonstrate your ability to train others. What subject will I be expected to train? You can train adult volunteers in your areas of expertise eg programme sections, outdoors, first aid, music, management etc. The choice is yours! I have some training experience already will this be taken into consideration? If you have previous or professional experience of training, your meetings with your tutor will ascertain how much of this can be carried across to your Trainer Qualification and as such, what you have left to complete. What background knowledge will I need? Trainers need to be aware of recent and relevant Girlguiding publications, and keep up to date with policy matters and changes in methods. Training is a great, fun way of being involved in guiding at different levels and travelling to share your experiences and ideas while meeting new people and perhaps bringing ideas home from them! There are many opportunities open to volunteers. You might want to take on a personal challenge, develop your skills, share your experience with others or take on a supporting role in your District, Division or County. Below are some of the many opportunities open to you. If there’s something else not listed that you’d like to be involved with, please speak to your Commissioner. Districts, Divisions, County and various County committees all need secretarial support. In most cases, this involves attending a few meetings per year, taking and then distributing minutes (usually electronically). This is a role which may be held by a non-member. Contact your local Commissioner for more information. All units, Districts, Divisions and County need Treasurers to make sure their finances are in order. In a unit, it is not always the unit Leader who does the accounts. This is a role which may be held by a non-member, although all Treasurers are subject to Girlguiding recruitment checks (including DBS). Contact your local Commissioner for more information. For the Leadership Qualification (LQ) every new Leader needs a Mentor. Qualified Leaders may also need Mentors eg for activity or residential qualifications or when taking on a Commissioner role. Mentoring is a partnership between you and a learner, which is designed to build confidence in the learner and help her to achieve a goal she has chosen. 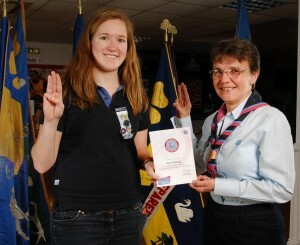 In this case a Girlguiding qualification. What experience do I need to be a Mentor? You will need to hold the qualification that you are going to mentor someone else to achieve. For the Leadership Qualification it can be any Leader holding the LQ or a Leader who has just completed her LQ (a chance to share the experience and reinforce her own learning). You need to be enthusiastic so that your enthusiasm will be passed onto your mentee! There is an e-learning module for you to try. This can be found at www.girlguiding.org.uk > E-learning > Mentor > Mentor module. Your County, Division or District will be able to advise you of the next Mentor meeting/training in your local area. There will also be on-going support from the Coordinator or Adviser for whichever scheme you want to mentor. Being a Mentor will cost you nothing except your time! Expenses will be paid at a local level for meetings, visits to units etc and for your training. The Leadership Qualification: tell your local Commissioner and she will discuss the role with you. Alternatively, contact the County Leadership Coordinator. Activity or residential qualifications: contact the relevant Adviser. Commissioners: contact a County Commissioner – she will tell you how you can help. Commissioners, whether at District, Division or County level, are responsible for supporting guiding and Leaders within a specified area. What do I need to become a Commissioner? The main thing you need is enthusiasm for working with a team of adults to support them in delivering good guiding through good practice. You may have skills and qualities gained and developed in the workplace or in other volunteering roles which are transferable. Communication, leading and building a team, tact, diplomacy and flexibility are all important. A Commissioner develops her skills over time though and is not expected have them all at the outset. I haven’t been a Leader very long, so can I be a Commissioner? There is no minimum length of service as a Leader before taking on a Commissioner role. You do not have to have been a District Commissioner to become a Division Commissioner, neither do you have to have held other Commissioner roles to become County Commissioner. The person is more important than their history. Yes of course. Many of our District, Division and even County Commissioner roles are shared; it’s practically the norm! There are great benefits to sharing the role with someone you can work well with. Striking the work/life/guiding balance right is very important. You start as a Commissioner Designate for up to six months; this allows you time to settle in to the role. You then have a discussion with one of the County Commissioners to check that you are happy to continue. You will be allocated a Mentor, usually a Leader who has experience as a Commissioner, to help you through the initial period. She will be able to answer any questions you may have and provide advice, for as long as you feel it is useful to you. Networking with other Commissioners is very valuable. You will meet other Commissioners at Division or County meetings. We also hold Commissioner Forums or Trainings in the spring and autumn terms within County and there are occasional Region Commissioner Conferences which you may be invited to attend. Advisers have an area of specialism which they share with others within the County. This may relate to a particular section of the programme (eg Rainbows) or it may relate to an activity (eg music or boating). It may also relate to a specialist area of knowledge or expertise (eg Safe Space or PR/communications). The role of the Adviser varies according to the specialism although enthusiasm for the particular specialism is common to all. He or she may offer any combination of advice, training or resources to support Leaders within the County. We are keen to recognise the contribution of our many volunteers who give their time so freely. We hold an Awards and Celebration of Guiding evening annually when we present long service awards and other awards which recipients have been nominated to receive. If you would like to nominate a Leader for a discretionary award, please contact the chairperson of our Awards Committee ([email protected]org.uk) to discuss which award is most fitting.